I wanted to take the time to thank you for all of your assistance in preparing for the 2008 World Mondio Championships with my malinois Mangouste. We successfully competed at level 3 (the highest level) and finished 6Th place out of 33 dogs from around the world. It was the first time an American team ever qualified in Europe, much less placed so high. 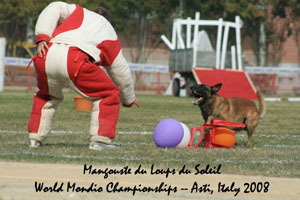 Mongoose was the youngest dog at category 3. I feel your strong background in dog training coupled with your unique decoy skills was a major contributing factor in our success. Thank you for your continued support, When I return from Prague, Czech Republic I will want to start preparing for the Championships in Belgium this year.